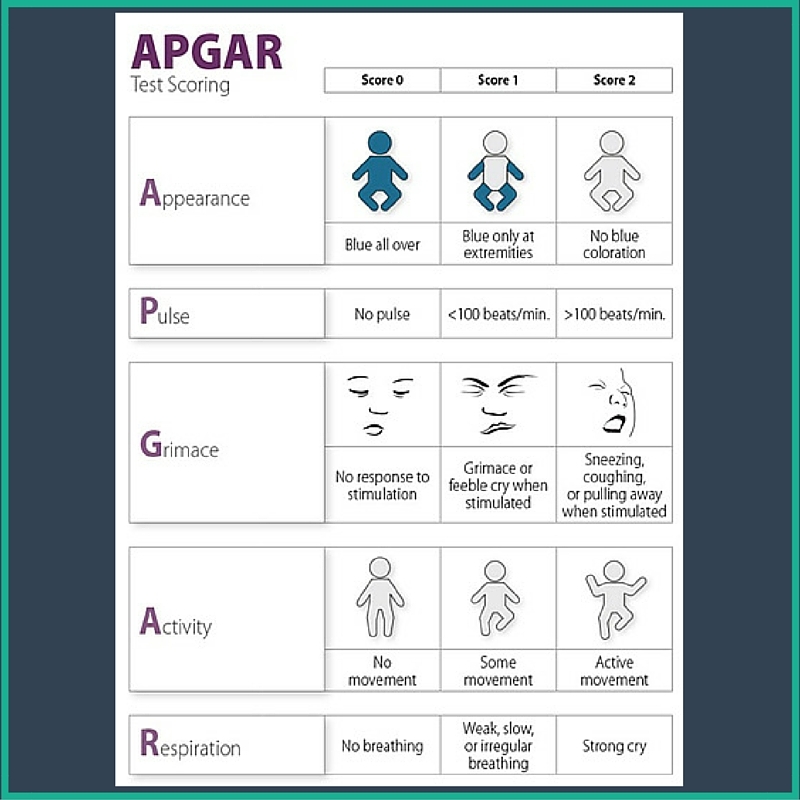 The Apgar score was devised in 1952 by Dr Virginia Apgar (anesthesiologist) as a simple and repeatable method to quickly and summarily assess the health of newborn children immediately after birth. This helps to identify those requiring resuscitation and can also be used to predict survival in the neonatal period. Apgar scoring is divided into 1 and 5-min scores. 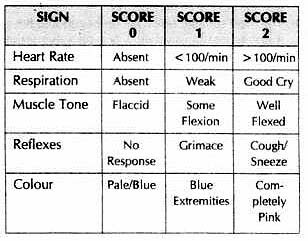 Sixty seconds after complete birth, the five parameters specified in the table above must be evaluated and scored. A total score of 10 indicates that the baby is in the best possible condition. A score between 0-3 means that immediate resuscitation must be done. The score was not designed to predict neurological outcomes. It is normal in most patients who subsequently go on to develop cerebral palsy. The score at 5 minutes associated with a low pH is a better indicator of neonatal mortality. Umbilical artery pH less than 7 and a 5-min score of 0-3 increases the relative risk of mortality in both pre-term and term babies. after 12 min, that's when he began wailing and screaming and kicking. scariest 12 min of my life. he is a strong and bonnie lad. Graduates highschool next year and beginning college while in high school. don't let the fear of what may develop scare you as a parent. I believe the terms of his birth played a part. he was 4 weeks overdue. he was diagnosed with Brachial palsy and epilepsy. However, I never raised him to know this stuff as a child. He has not had a seizure since 3 days old and he has full and complete use of his right arm that has the palsy and he doesn't even know he has palsy.